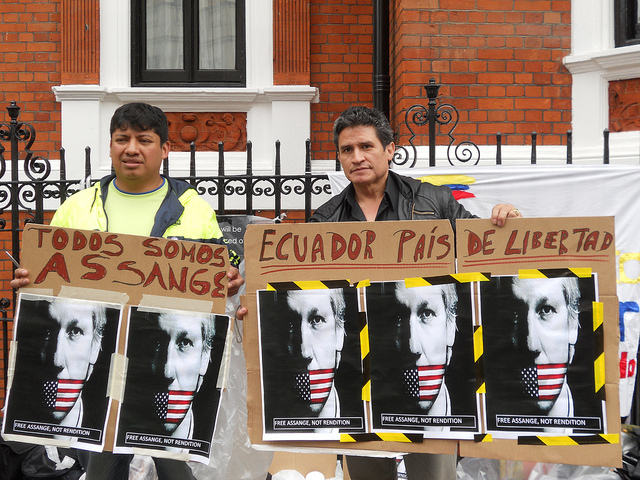 A vigil has been maintained at the Ecuadorian Embassy in London since Wednesday in solidarity with Julian Assange who took refuge there on Tuesday and is seeking political and protective asylum in Ecuador. The vigil continued until late Thursday evening. The vigil has now resumed today, Friday 22 June, and will continue throughout the day. Support it if you can. 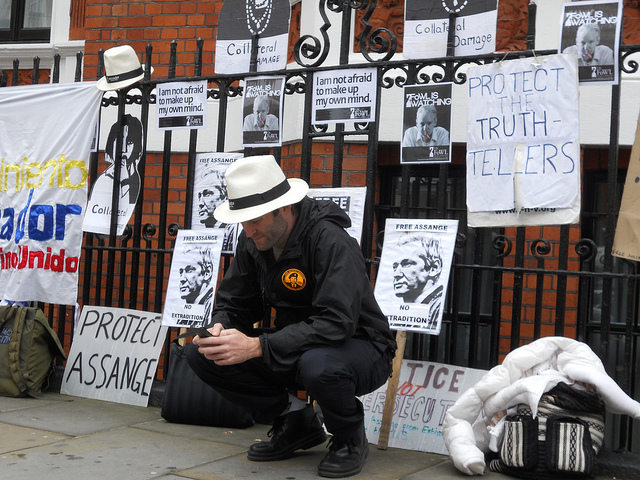 A varied group of supporters has mounted a vigil since 1100hrs on 20 June. Thanks to Roland and Sue for doing the night shift. Today we had a good number of people turn up. 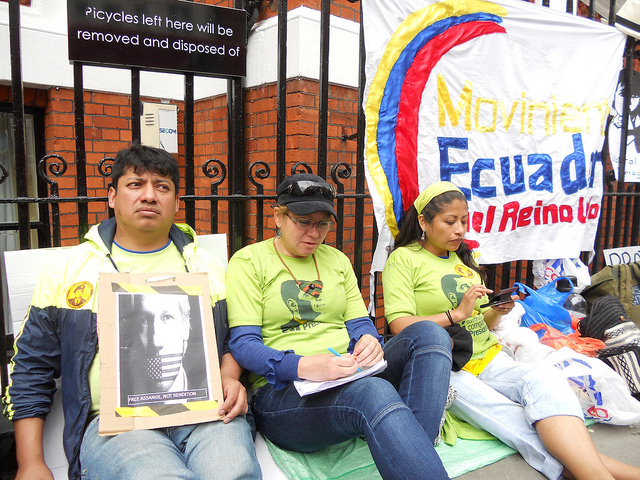 We are not continuing through the night, however some of the Ecuadorian group said they might stay very late. When I left with Serena this evening there was still a sizeable group present. Tomorrow I will be heading back and will spend the day there. Belgique and Juan will also be there and hopefully the numbers will build up throughout the day. 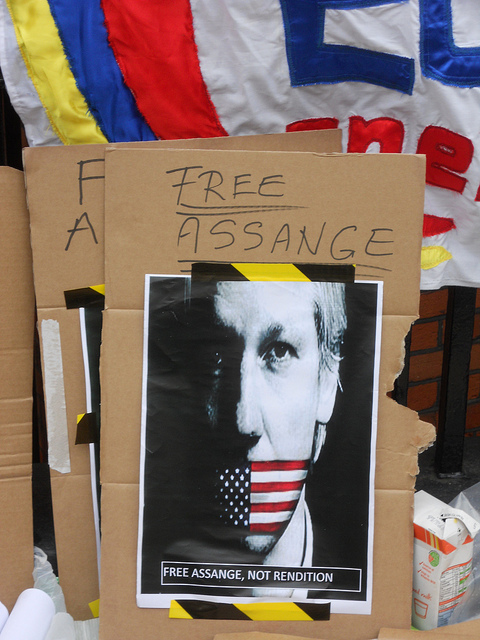 The Wikileaks crew have expressed their gratitude and said they didn’t expect a decision today. I and a few others are ready to move at short notice if something happens tonight. The situation is still fluid and we will reassess the situation tomorrow. 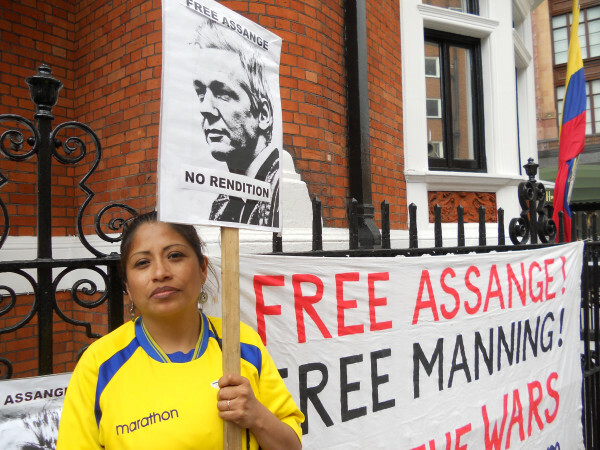 The rally planned for the Swedish embassy on 28 June will go ahead as planned. For more photos, including plainclothes cops attending the vigil, see IT Friends of Bradley Manning on flickr. 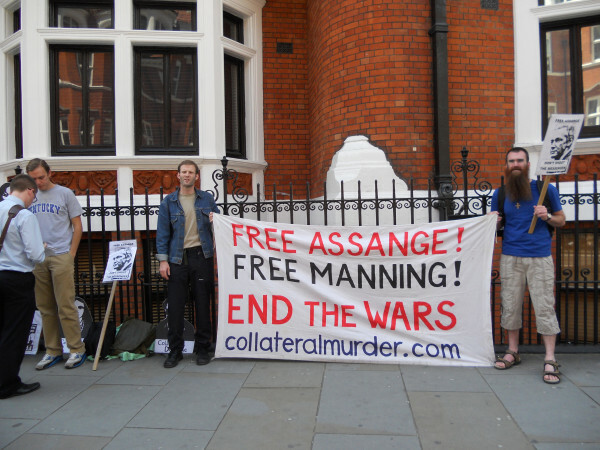 Gallery | This entry was posted in Announcements, Assange and tagged anti-militarism, anti-war, asylum, Britain, Catholic Worker, demo, Ecuador, Ecuadorian Embassy, extradition, Julian Assange, London, solidarity, Veterans for Peace, vigil, WikiLeaks, WISE Up. Bookmark the permalink. thinking of coming to central london to join you, are you going to stay there overnight? CORRECTED REPLY! Sorry Paolo – this is the most up to date info I have. The vigil will be in place today but the situation is fluid, so check with the vigil mobile number before heading down there. Hope that helps.